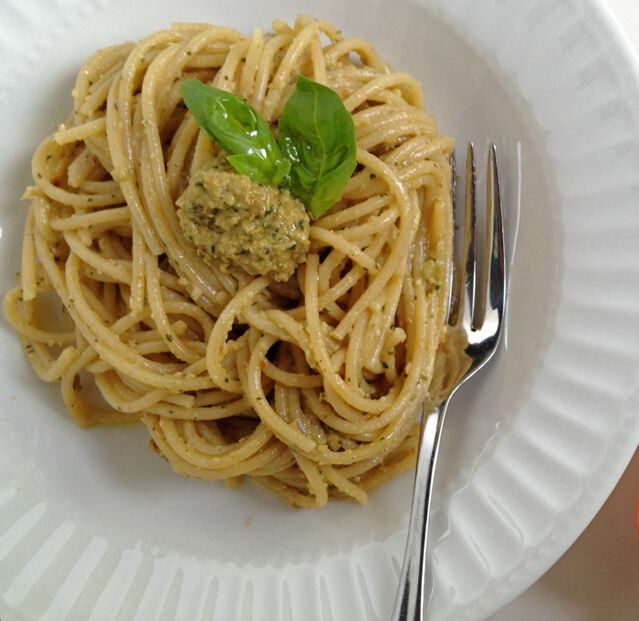 This pesto has a lot in common with bread and butter. Sometimes you spend a lot of time putting a feast together and the most popular dish took the least amount of effort. That’s not a complaint, just the truth, and it’s not to say that the whole feast wasn’t worth it. But it does remind me that the simplest things can’t be beat sometimes. Like a scoop of mint chip ice cream in a sugar cone, or warm bread with butter and salt. Hard to resist and hard to beat. 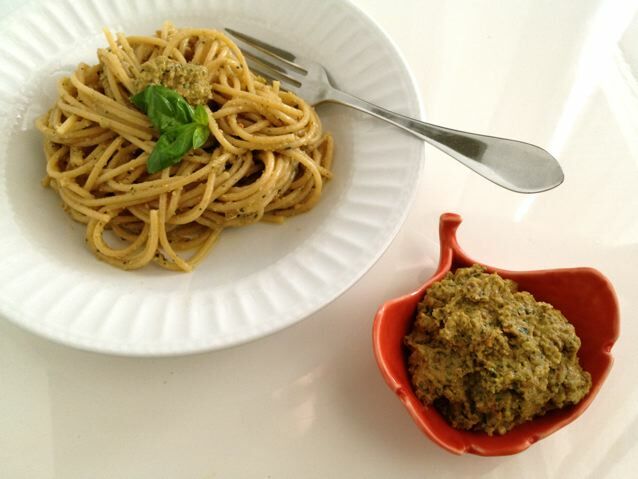 This eggplant pesto “beat” out most things at a recent lunch I hosted. It got the most “mmm’s” and the prize for second or third helpings. It is clearly hard to resist too, as I observed last night. James brought some to the table to dip pita into. I took a scoop and handed the bowl back to him. He devoured it. All. And claimed he thought I was finished. Ahem. It’s hard to blame him–it is one of those dishes. Caramelized eggplant, toasted walnuts and a nutty cheese make this as highly-flavourful as any pesto and extra luscious if you ask me. Press any liquid out of the eggplant slices (you should be left with about 225 g). Lay on parchment-lined baking sheets and brush the top of the slices with oil. Place under broiler, in batches, for 7-10 minutes depending on how thick your slices are but watch them closely as they go from pale to burnt in under 1 minutes. Remove them when they start to brown evenly and turn the tray if you start to notice hotspots for even cooking. Add the walnuts, garlic, cheese and sun-dried tomatoes to the bowl of a food processor and pulse a couple of times to roughly break up the walnuts. The add the basil and eggplant and pulse again only as much as needed to roughly combine and break down the eggplant. 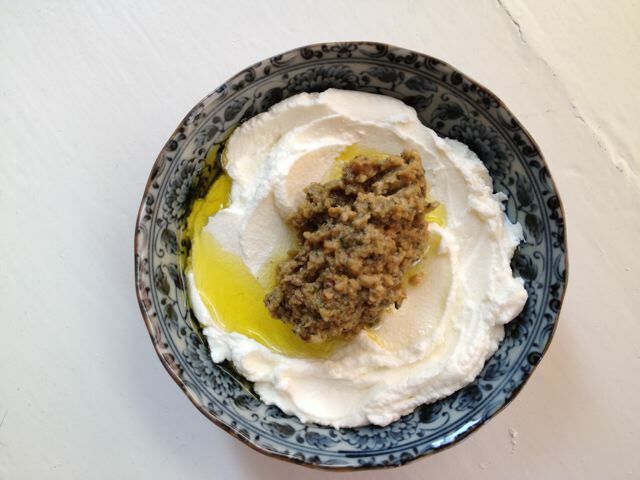 Now run the food processor and pour a steady stream of olive oil in until you form a rough paste–you want to retain as much crunch from the walnuts as you can and larger specs of other ingredients is fine too. Then add the lemon juice, mix and taste. Add salt if needed (the eggplant and cheese are quite salty) and serve over pasta, if you wish. You may also add a ladle of hot, reserved pasta water over top to loosen the pesto and even more to melt some of the cheese and create somewhat of a creamy sauce. Alternatively, serve with crackers and olives, yogurt and salad for a light lunch, or freeze the pesto, covering the top with a thin layer of oil to preserve the colour before sealing.